Are you looking to buy a home, but want to learn more? 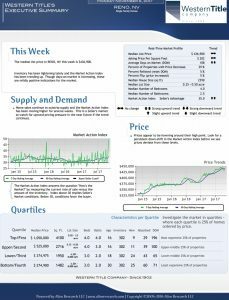 Western Title presents the Reno Market Report for this week. -The median list price in RENO, NV this week is $436,900. -Inventory has been lightening lately and the Market Action Index has been trending up. Though days-on-market is increasing, these are mildly positive indications for the market.